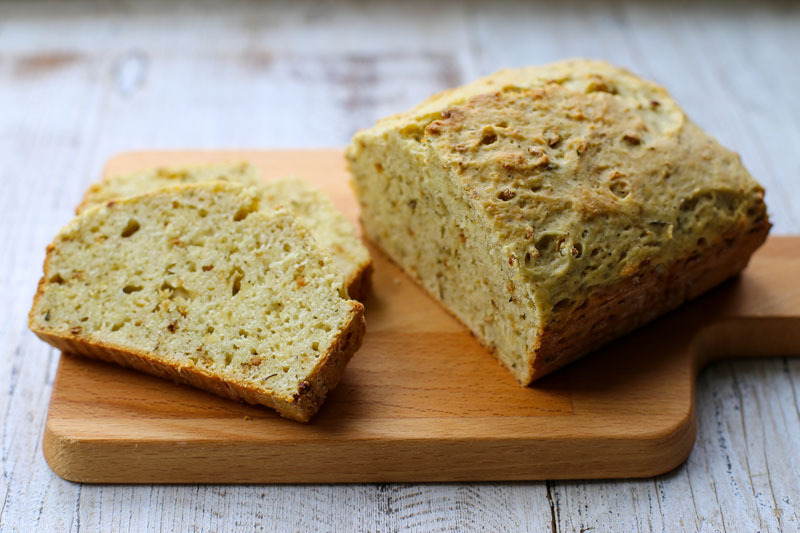 This quick bread is so, so easy to make. It’s called quick for a reason — there’s no rising time required, and it goes from ingredients to finished loaf in under an hour. Oh, and all of the ingredients are whisked together in one bowl, so there’s very little clean-up when you’re done. Best of all, the flavor is unbelievable. The tender buttermilk bread is perfectly moist thanks to our Garlic Gold® Nuggets in Oil (no butter required! ), and it’s studded with our savory, fragrant Herbs de Provence Nuggets. Cut into slices and serve it warm — alongside a bowl of comforting lentil or chicken soup, it’s a great meal for chilly nights. The bread is lovely on a holiday appetizer spread as well (Hello, Thanksgiving! ), next to your favorite olives and soft cheese. Preheat the oven to 350ºF. Grease and flour a large (9 by 5-inch) loaf pan. In a medium mixing bowl, whisk together the flour, sugar, baking powder, baking soda, and salt. Make a well in the center of the ingredients. 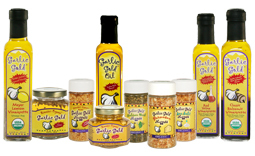 Pour in the buttermilk, Garlic Gold® (Nuggets in Oil), egg, and Herbs de Provence Nuggets. Whisk just until all of the dry ingredients are incorporated — the dough will be sticky and rough-textured. Transfer the dough to the loaf pan, spreading it out evenly. Bake for 45-50 minutes, until golden brown on top. To test for doneness, insert a toothpick into the center of the loaf — it should come out clean. Let the loaf rest in the pan for 15 minutes. Slice the loaf into 1/2-inch slices and serve warm. Alternately, you can wrap the loaf tightly in plastic wrap and store on the counter for a couple days. To freeze for up to three months, wrap the unsliced loaf in plastic wrap and aluminum foil. Inspired by the super-adaptable recipe from Emma at The Kitchn, you can feel free to improvise on your own loaf, too! Italian Herb Bread: Substitute our Italian Nuggets for an Italian twist, perfect for dunking in tomato soup. Southwestern Cheddar Loaf: Use Southwest Nuggets and stir in 1/2 cup of grated cheddar, and serve it with a cup of hearty chili.